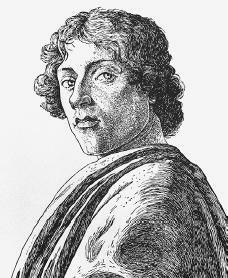 Sandro Botticelli was born in 1445 in Florence, Italy, the son of a tanner (one who converts animal skins into leather). Not much is known about his childhood or early life. In 1460 he began training with Fra Filippo Lippi (c. 1406–1469), one of the greatest painters of the Renaissance. Botticelli's first works followed the current version of the popular style in Florence used by artists such as Andrea del Verrocchio (1435–1488). This style placed great importance on the human figure rather than on space. Botticelli's major early works are Fortitude (1470) and St. Sebastian (1474). In some of these he changed the appearance of muscular energy and physical action found in Verrocchio's work. The people in Botticelli's work are shown as melancholy and thoughtful. These qualities are most evident in Botticelli's best-known works, Spring and the Birth of Venus, executed for the estate of a cousin of Lorenzo the Magnificent, Lorenzo di Pierfrancesco de' Medici. Their precise subject matter has been the subject of much debate and has never been agreed on. Both works were certainly designed with the help of a scholar, but if there was a story invented for the occasion that would explain the works, it was not recorded. Since Venus has a central position in both works, it is possible to consider the two figures of Venus as a contrasting pair. Botticelli continued using this early style after 1480 (the Birth is perhaps as late as 1485), but a new style soon emerged in frescoes (paintings done on moist plaster with water-based colors) such as St. Augustine (1480) in the Church of the Ognissanti, Florence; the Annunciation (1481) for San Martino, Florence; and three frescoes (1481–82) in the Sistine Chapel, Rome, Italy, executed during Botticelli's only trip away from Florence. These frescoes show a new concern with the construction of stage like spaces and stiffer figures, also seen in a series of altarpieces (works of art that decorate the space above and behind an altar) of 1485 and 1489. The influence of the work of Domenico Ghirlandaio (1449–1494) and of Flemish painting can be seen, but it is clear that Botticelli's art had not undergone any major changes. After 1490 Botticelli concentrated on paintings with many small figures, so that the entire picture surface seemed more alive. Many works exhibited this new method, such as the Calumny of Apelles, a drawing of a description of a painting by an ancient Roman writer; the Crucifixion, with a rain of arrows falling on a view of Florence in the background; the Last Communion of St. Jerome, the most intense of several works showing physical collapse of the body; and the Nativity (1501), which used an old design of Fra Angelico (c. 1400–1455) and an inscription referring to current predictions of the end of the world. Botticelli became crippled in his later years and failed to receive painting assignments. He may have continued to work on his set of drawings (never finished) illustrating Dante's (1265–1321) Divine Comedy. By about 1504, when the young Raphael (1483–1520) came to Florence to observe the new styles of Leonardo da Vinci (1452–1519) and Michelangelo (1475–1564), Botticelli's art must have seemed old-fashioned, although it had been widely copied in the 1490s. Sandro Botticelli was born several generations after Donatello (1386–1466), Masaccio (1401–1428), and their associates who gave Florentine art its direction, and just before it took a great turn in the works of Leonardo da Vinci, Michelangelo, and others. Botticelli worked in an established, almost traditional manner at a point just before such a style went out of fashion. Successful in the 1470s and 1480s, then forgotten at the time of his death in 1510, Botticelli was popular in the nineteenth century, especially in England. Argan, Giulio. Botticelli: Biographical and Critical Study. New York: Skira, trans. 1957. Lightbown, R. W. Sandro Botticelli. Berkeley: University of California Press, 1978. Venezia, Mike. Botticelli. Chicago: Children's Press, 1991.